Right next door to big-hitter Bath, Bradford on Avon is a gorgeous Cotswold town, perfect for a slow weekend away. Clare Wiggins gives us her top tips. I have been visiting the attractive Wiltshire town of Bradford on Avon for more than two decades but it is only in the last few years that I’ve looked around and thought yes, this is somewhere I would come even if my parents didn’t live here. 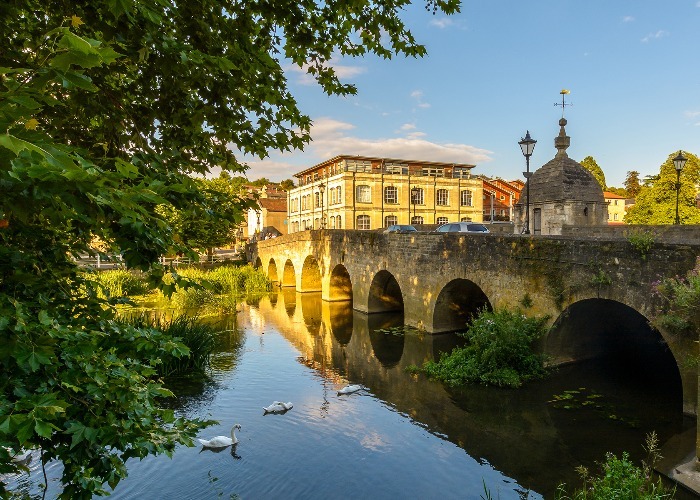 Beautiful and historic buildings, independently-run shops alongside cute cafés, river walks, hidden stairways and unexpected alleyways – the town has the feeling of somewhere unique that hasn’t yet been discovered by the swarming tourists from nearby Bath. 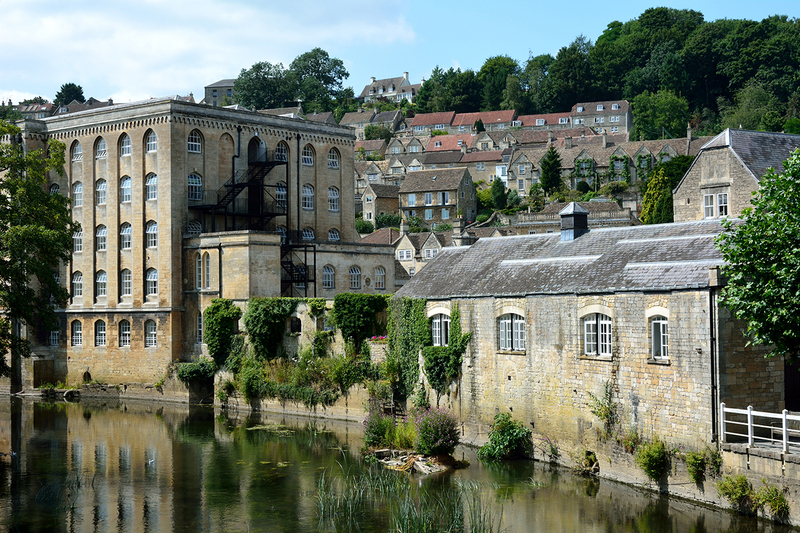 At its heart the river winding through Bradford on Avon’s centre explains the 17th-century textile industry origins of much of the buildings. At one point there were around 30 woollen mills in the town located alongside the river, using water to power the looms. Many of the buildings from those days are now hotels, restaurants or even houses. But beyond the water, a recent development of shops, restaurants and a stylish hotel has given the town a new edge that makes it worthwhile exploring. You could easily spend your time café hopping, walking by the river, and nosing around little gift shops. But to really get a feel for the town you also need to head up the hill, stopping along the way at some of the historical sites and ending with a breathtaking view across the valley. On a clear day you can see as far as the white horse at Westbury. Here’s how to spend a perfect weekend in Bradford on Avon. Get there: by train. There are direct trains from London Paddington to Bath, where you can change to get the local service towards Westbury and arrive in Bradford in just 15 minutes. Check into: Timbrell’s Yard, a relatively new hotel on the banks of the River Avon. All wooden floors, merino wool, and understated muted tones, the hotel’s transformation from a slightly dingy pub to its present-day incarnation neatly sums up the change that has happened across the town. The rooms are cool but inviting. Breakfast is a tempting take on the full-English classic and rooms include toiletries by Somerset-based Bramley and little packets of fudge produced by local company Megs. Ask for rooms 106 or 205 for lovely views over the river. Take a stroll: either over Bradford on Avon’s famous 14th-century bridge and along the river, or via the McKeever Bridge named in honour of local Olympic gold medallist kayaker Ed McKeever. End at Market Street where you can grab a drink at the Dandy Lion pub – try to bag a window seat at the front for a spot of people-watching. Eat dinner: at the The Bear Inn on Silver Street. The pies are hearty and delicious – we love the filling steak and stilton. Explore: Pick up a walking map from the town’s tourist office on St Margaret’s Street and head up the terraced hill via the tiny Saxon church of St Laurence. It’s a very plain building but there is something serene about its simplicity. Carry on up past buildings crafted from the beautiful golden stone so recognisable to those who know Bath. Keep going to the top, up steps and along narrow pathways until you find your way to the Chapel of St Mary Tory – believed to have once been on the pilgrims’ route between Glastonbury and Malmesbury. The view from here is glorious. Learn at: the Bradford on Avon museum. If it's raining head to this small but infomative museum upstairs in the library building, stuffed with treasures that tell the story of social history in the area through the ages. You could easily spend an hour looking around the collection which includes a mock-up of an old pharmacy and a child-sized roman stone sarcophagus found in a local field. Grab lunch: at the friendly Fat Fowl on Silver Street, or if the weather is agreeable, order a fresh panini or baguette from Bread and Butter sandwich shop and eat it al fresco by the riverfront. Though you may find you have the town’s resident swans for company. Shopping: Bradford on Avon has some excellent little shops, including vintage clothes boutiques, a fantastic cheese shop, and an independent book store. You can easily while away an afternoon browsing and buying. Go for pizza at: Pizzeria Amici. This family owned pizzeria offers an enticing selection of traditionally stone-baked pizzas as well as pastas, salads and more. It’s a cosy place, so book in advance. Brunch at: the Lock Inn Café. This place offers the real deal on a proper English breakfast. When it’s too cold to take a walk or if it’s raining, this is an excellent spot to enjoy a couple of hours catching up on the Sunday papers. Ask to eat inside the narrowboat moored up outside – it’s part of the restaurant – and watch all the comings and goings on the river. Visit: Tithe Barn. This spectacular 14th-century structure is one of the best-preserved medieval barns in the country and is part of a complex of old farm buildings and little crafty shops. The West Barn often plays host to photographic exhibitions, so catch some culture while you’re there. Walk or cycle: the Kennet and Avon rivers. The path that follows both the River Kennet and River Avon can take you all the way to Bath if you’re up for the challenge. You can hire bikes from TT Cycles and spend the morning cycling as far as your legs will let you alongside the colourful boats moored along the canal edge. Look out for diving kingfishers as you go.